« How can we measure the success of market intelligence? Data is the new oil. Data is the new oil. Data is the new oil. Yes, that’s true. Just like those countries whose GDP has been built on oil resources, companies that are looking to gain competitive advantage with big data resources are facing difficulties. The amount of data available is growing exponentially, access to big data is cheap, and information is ubiquitous. As Julian Birkinshaw and Jonas Ridderstråle argue in their book ‘Fast/Forward’: information is no longer giving your business a competitive advantage. Instead of collecting more data, we need intuition and ‘a leap of faith’. Birkinshaw and Ridderstråle link all of this to the big transition that is currently taking place: The Information Age is about to end. Are businesses going to be run on gut-feeling? Is this the end of data-driven decision making, informed leadership, strategic planning, quarterly financial benchmarking, monthly sales reporting, analysis, my job? No. Analysts, business strategists, and you [whatever your position is] need to be capable of curating and interpreting data, asking questions and using intuition when examining data – and then having the courage to take that leap of faith. This means a new view of strategy, a new organizing model, and new people skills. It requires what Edmondson and Verdin call strategy-as-a-learning: ongoing cycles of testing and adjusting, fueled by data that can only be obtained through execution. Birkinshaw and Ridderstråle list four Paradoxes of Progress that shape today’s business environment – and are changing competitive advantages. What do these Paradoxes mean? And what can you do to address them? What does this mean? Jobs, companies, and industries are vanishing. Your competitive advantages have ever-shortening shelf-lives. What can you do? Make sure your strategy is action-driven, diverse, lean, and agile. Move forward faster and in a different direction than other players. The Blue Ocean Strategy duo, Kim and Mauborgne, refuse to see the landscape solely as a zero-sum-disruption-game, and offer instead a strategy for improving marketing share through customer creation. What does this mean? We are linear people and companies in an exponential (data, innovation, competition) reality. Every day as you wake up and begin your working day, you understand a little bit less than the day before. What can you do? Develop your company’s capacity to cooperate across the ever-widening ecosystem and to have diverse debates with a deadline. Make technology your friend: invite AI to be part of your management meetings, and have cobots supporting your daily hybrid decision-making process. What does this mean? VUCA 2.0. 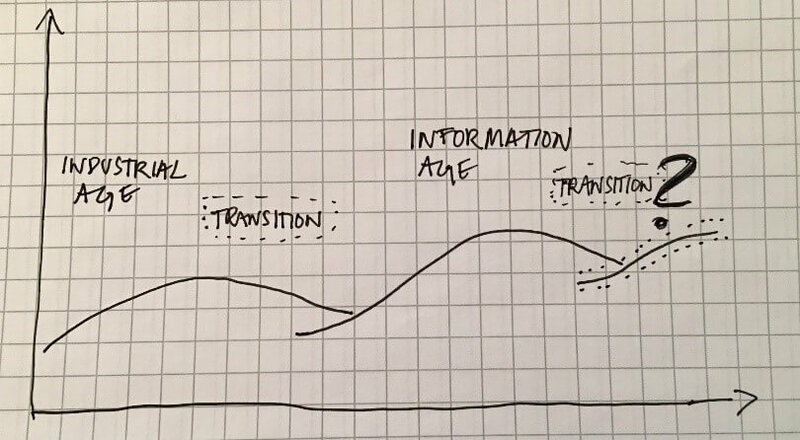 Making sense of the enormous trend space is harder than ever – your operating environment is full of wildcards, black swans, unforeseeable events, unintended consequences, and feedback loops. What can you do? You can’t predict the future – assume responsibility for creating it. Perform landscape and scenario analysis 2.0 with the help of real-time information. Avoid “the more unpredictable the things become, the more plans we would like to make” -trap (though you have enough data to make more plans than ever!). Reduce the level of central control – front-line knows first. Take a leap of faith. What does this mean? We are in constant battle between intuition vs data and emotion vs information. The human brain is a belief engine as much as a thinking machine. In theoretical decision-making utopia: we gather all the evidence, apply logical reasoning, and end up with a clear judgement. In reality: we have an intuitive viewpoint, which helps us to reach a judgment, and then we seek evidence that supports that judgement. What can you do? Be aware of biases and thinking errors (e.g. Apophenia: the identification of meaningful connections in meaningless data). Bring diversity of perspectives into your decision-making processes. You don’t need the full data set – just make sure you have a trusted and legitimate expert to summarise the relevant information for you. In the Fast/Forward landscape, you need to ‘see around corners’ to avoid ‘gradually… then sudden’ decline as noted by Anand Sanwal. Geoffrey A. Moore talks about the imperative of catching the next wave, as wave after wave of next-generation technologies and innovations are continually transforming the business landscape. To manage disruption and to stay ahead of the curve, you need to look to the future, monitor what is happening, and be able to pick up trends and signals among the noise. Do some ‘sensing’ as Birkinshaw and Ridderstråle label it. What is sensing when done well? Seek out dissonant information. Abnormal is the new normal. Enliven the debate. Go beyond the facts, use intuition. Be more opportunity-focused. Business happens in real-time, engage in future-oriented brainstorming. Expose your customers’ unarticulated needs. Add insights to foresights. Practice hands-on sensing: follow, listen, observe your customers. Are you ready to renew your ways of working? To become fast/forward? To move from data collection to action? If you are seeking a partner to help you navigate the Fast/Forward landscape, M-Brain is your ally in strategy work – sensing the market environment with you. M-Brain is a global information, technology and consulting services company. We help our clients to navigate the turbulent and ever-expanding business environment. We offer crucial external business information, and advise in its efficient management and utilization. We turn information into actionable insights for daily decision-making and strategic planning. We call it Informed Leadership.